Presenting a large, unprecedented and surprising estate, this exhibition reveals the almost unknown history of the Calouste Gulbenkian Foundation’s intervention in Iraq. Photographs, videos and original documents from the Gulbenkian Archives, along with works of art from the Gulbenkian Museum’s rare section of Iraqi Art, are shown for the first time. The Al-Shaab Stadium (the People’s Stadium), the sports complex inaugurated in 1966 in Baghdad, was the pièce de résistance of the Calouste Gulbenkian Foundation’s strategy to further the cultural, educational, welfare and scientific development of Iraq. This project benefited from earlier experiences such as increased support for local initiatives since 1957 and the completion of the Modern Arts Centre in 1962 in particular. With a programme of significant scale and complexity, this was also the most important work undertaken by the Foundation outside Portugal in the 1960s – comparable only to the construction of the Foundation Headquarters and Museum in Lisbon. Because of its visibility and novelty, the complex was the central element of the public relations efforts that accompanied the Gulbenkian philanthropy operations in the country. The structure, a direct intervention by the Foundation which survived several changes of regime and government, was consistently presented as instrumental in developing a new national identity: physical activity and sport would play a fundamental role in the everyday life of the new Iraqi – and republican – citizenry. 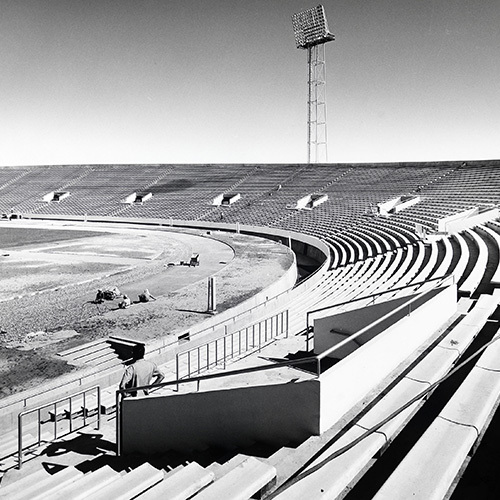 View of the uncovered stands at the Al-Shaab Stadium, Baghdad, c. 1965. Gulbenkian Archives. Al-Shaab Stadium, Baghdad. 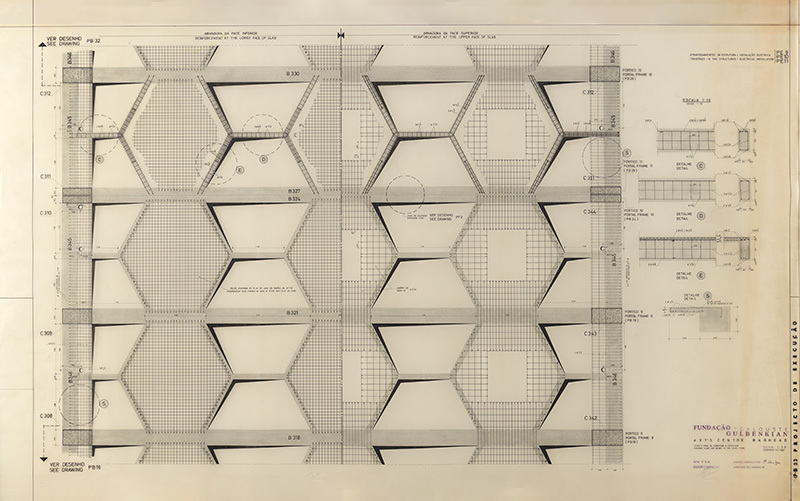 Stands structure, P1 portal-frame (construction plans), 1962. Indian ink on tracing paper. Gulbenkian Archives. 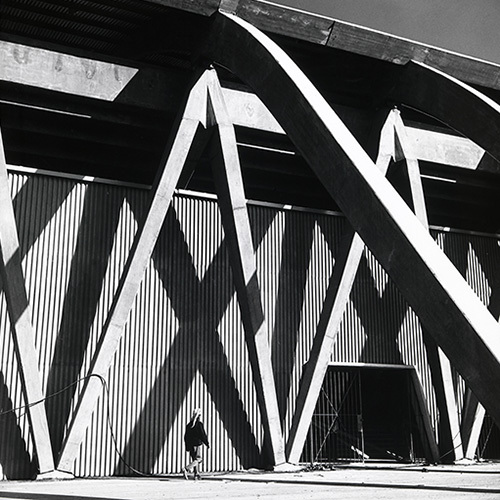 Rear face and entrances to the covered seating of Al-Shaab stadium, Baghdad, c. 1966. Gulbenkian Archives. Between 6 and 13 November 1966, the Gulbenkian Cultural Week was held in Baghdad by the Foundation to mark the inauguration of the sports complex of the the People’s Stadium in the Iraqi capital. The Cultural Week included concerts by the Gulbenkian Chamber Orchestra and Choir and other events, such as the presentation in the Modern Arts Centre, built by the Foundation in 1962, of a large exhibition of Portuguese and international art. 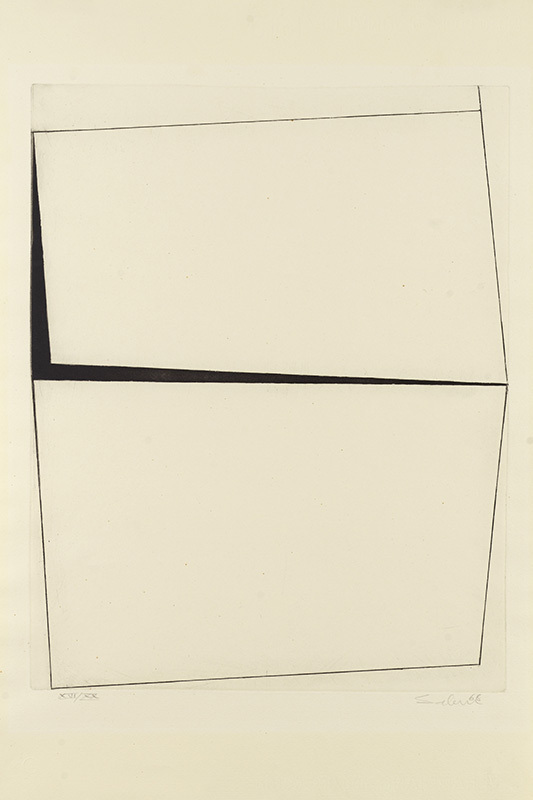 These works would form the initial basis of the Modern Collection and were gathered together then for the first time. The Cultural Week was also an opportunity for the Foundation to acquire a rare set of Iraqi artworks and to deepen its policy of support for the training of, and production by, local artists. The establishment of a material infrastructure was accompanied by the promotion of artistic creation. Marcelino Vespeira (1925-2002). 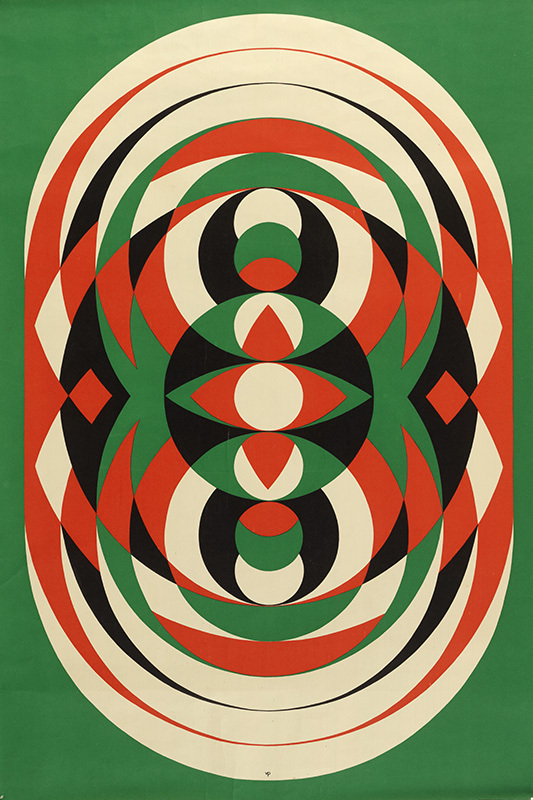 Original poster for the Cultural Week promoted by the Calouste Gulbenkian Foundation in Baghdad, 1966. Pedro Vespeira collection. 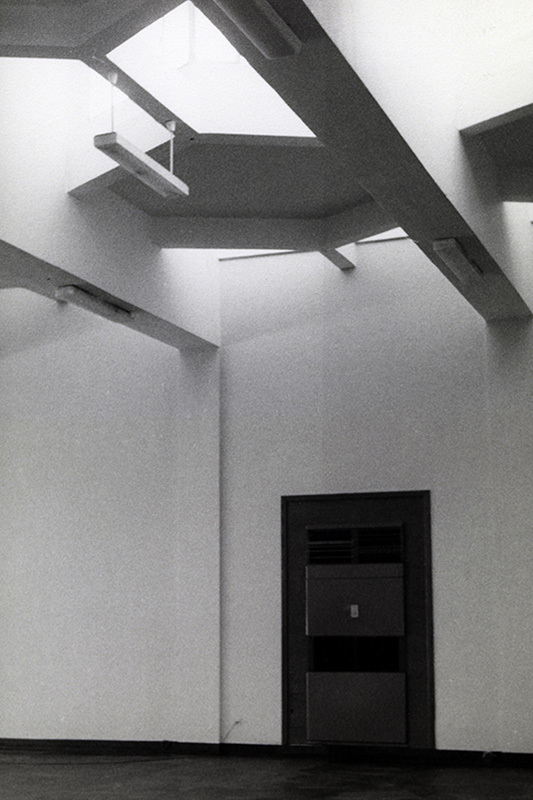 The Foundation organised the Exhibition of Works of Contemporary Art belonging to the Calouste Gulbenkian Foundation at the Modern Arts Centre (MAC) during the Gulbenkian Cultural Week in 1966. The exhibition brought together a total of 70 works, including 51 paintings, 6 drawings and 13 prints produced by 48 Portuguese and 22 international artists. 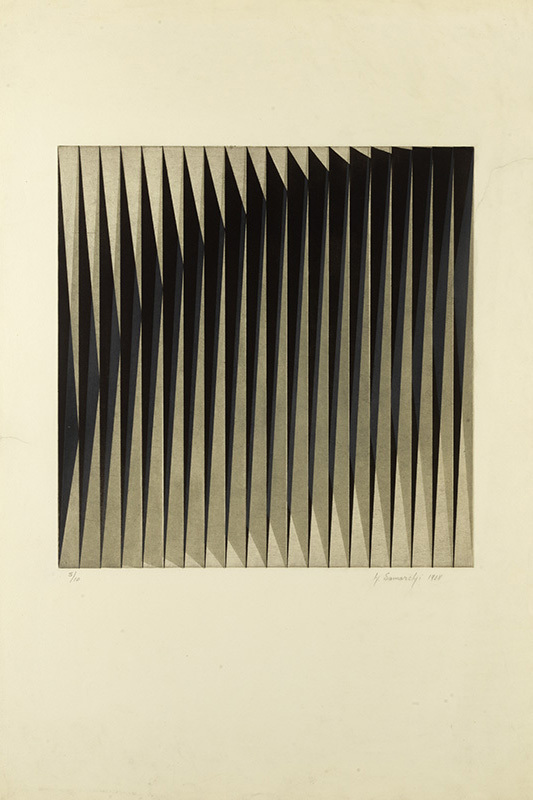 The works shown in Baghdad had been recently acquired by the Foundation. The exhibition on the first floor of the MAC was open to the public for two weeks under the high patronage of the Ministry of Culture and Guidance of Iraq. 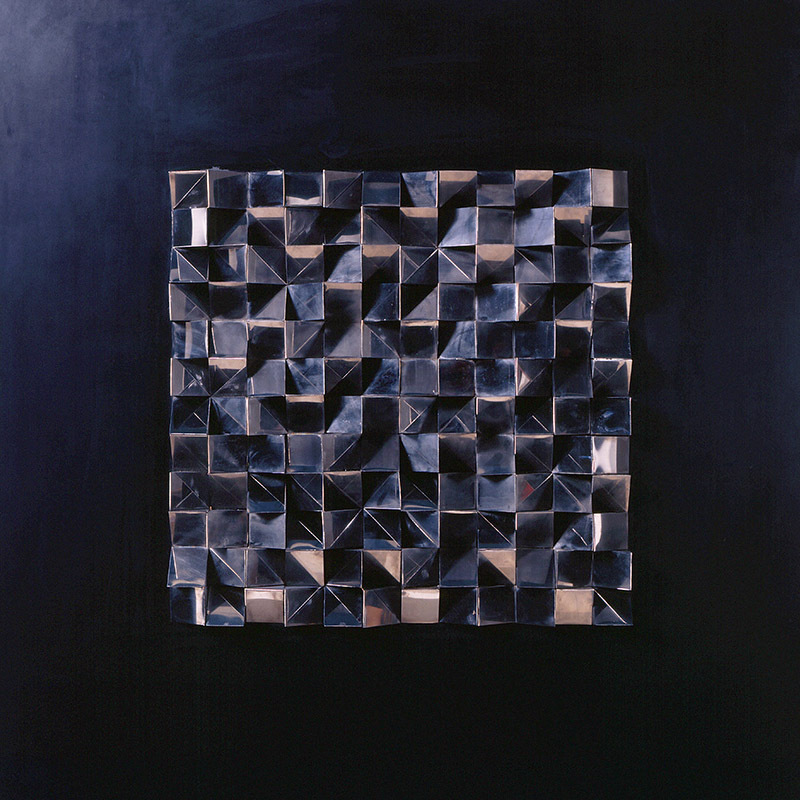 A selection of these works is presented in this exhibition and in the gallery dedicated to painting from the 1960s in the Modern Collection building. Waldemar da Costa (1904-1982). 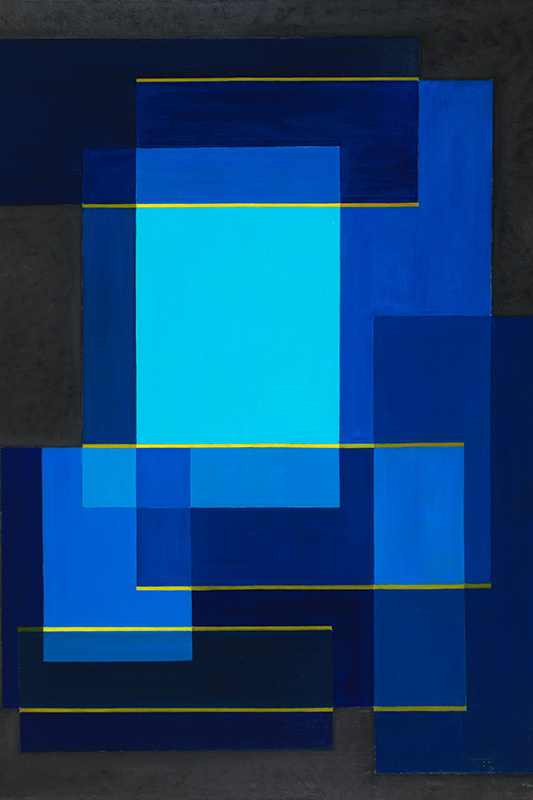 ‘Composition in Blue’, . Acrylic paint on canvas. Modern Collection, inv. PE36. 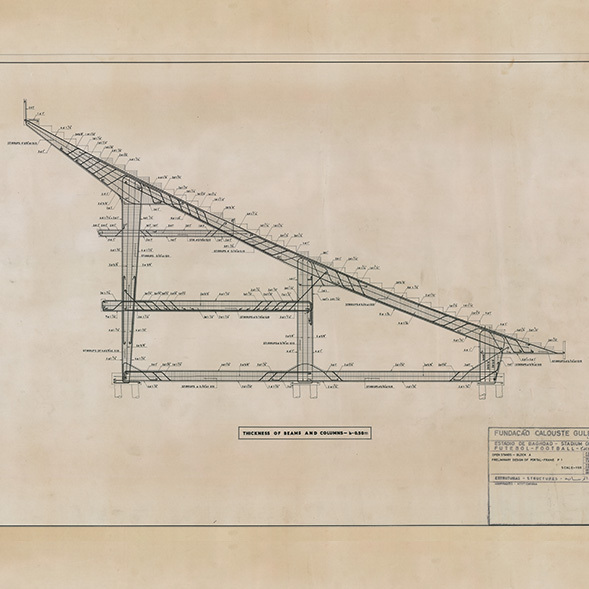 The idea of supporting the construction of a modern art centre – something completely lacking in Baghdad to that point – as an incentive for contemporary artistic production corresponded with the Foundation’s objectives of financing educational, cultural, welfare and scientific projects in Iraq. 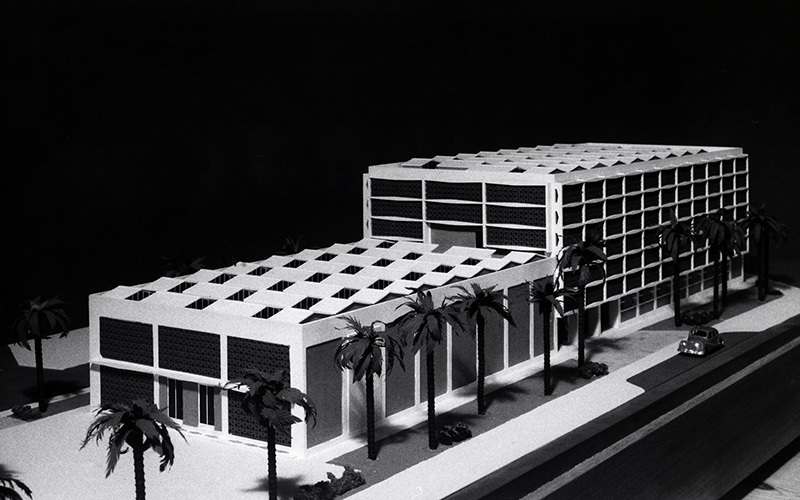 The Modern Arts Centre in Baghdad, inaugurated in 1962, was the calling-card project of the Calouste Gulbenkian Foundation’s operations in Iraq: a technically simple and pragmatic project. It also responded to an unquestionable need with clear cultural aims. A direct intervention – and not the provision of a grant, as would become the norm from then on – would demonstrate the institution’s capacity for serious accomplishment. It would also serve as a rehearsal for the final work built directly by the Foundation, the Al-Shaab sports complex. Between the adjustment of the project brief and the execution design stages, this process shared between Portuguese and Iraqi technicians is strongly reflected in the admittedly unpretentious architectural result. 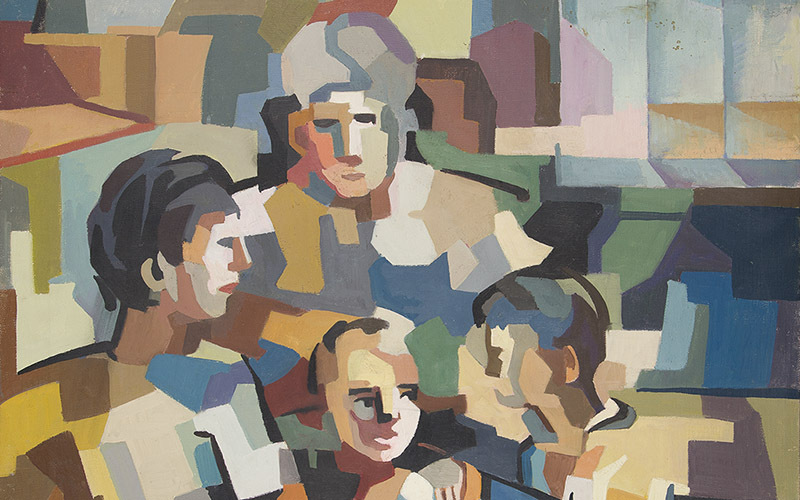 In December 1962, during a visit to Baghdad by the President of the Foundation, José de Azeredo Perdigão, and the Director of the Middle East Affairs Department, Robert Gulbenkian, the first set of 12 paintings by Iraqi artists were acquired by the Foundation. 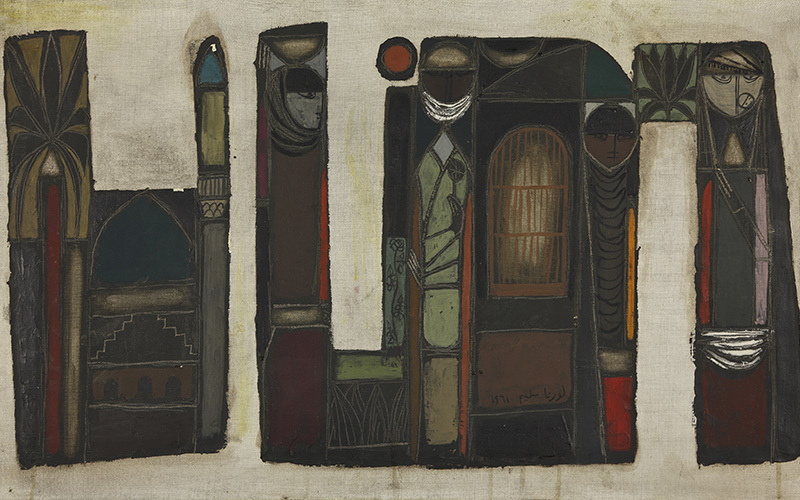 A large number of these works are shown here: paintings by Faik Hassan, Lorna Selim, Hafidh Al-Droubi, Ismael Al-Shaikhli, Saadi al-Kaabi, Khalid Al-Jadir and Nezar Selim. 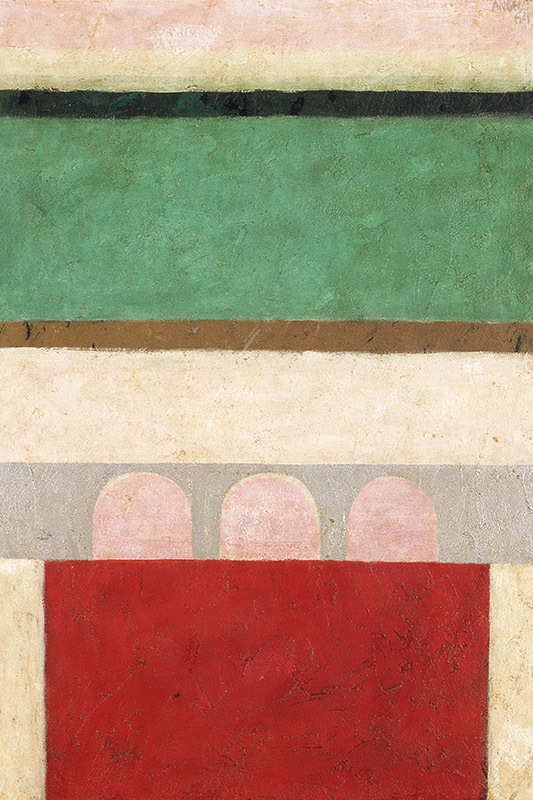 Some of these artists had studied at art centres in London, Paris and Rome, presenting work clearly developed in dialogue and interpretation of European modernism and fusing the Arab tradition with avant-garde styles. The Calouste Gulbenkian Foundation decided to intensify its role in fomenting an art scene in Baghdad with the creation of the Gulbenkian Art Prize, overseen by a committee led by the renowned Iraqi art critic and historian Jabra I. Jabra. Each year over a period of five years, an Iraqi painter and a sculptor would be awarded an approximately 35-gram gold medal of 3.5cmdiameter. 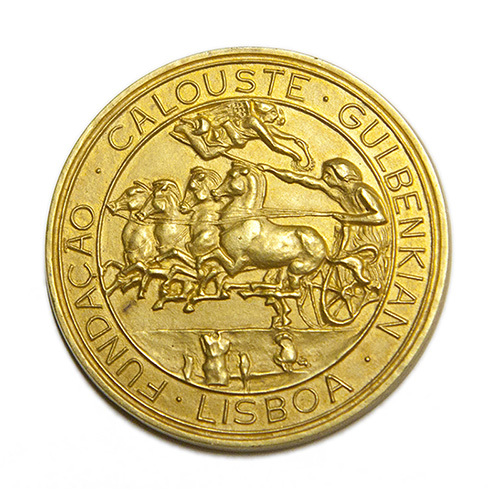 The design of the medal was commissioned by the Foundation directly from the Portuguese sculptor Joaquim Correia, who reproduced the seal of the institution on the face of a plaster model. The medal was delivered in a leather case along with 200 Iraqi Dinars and a certificate. 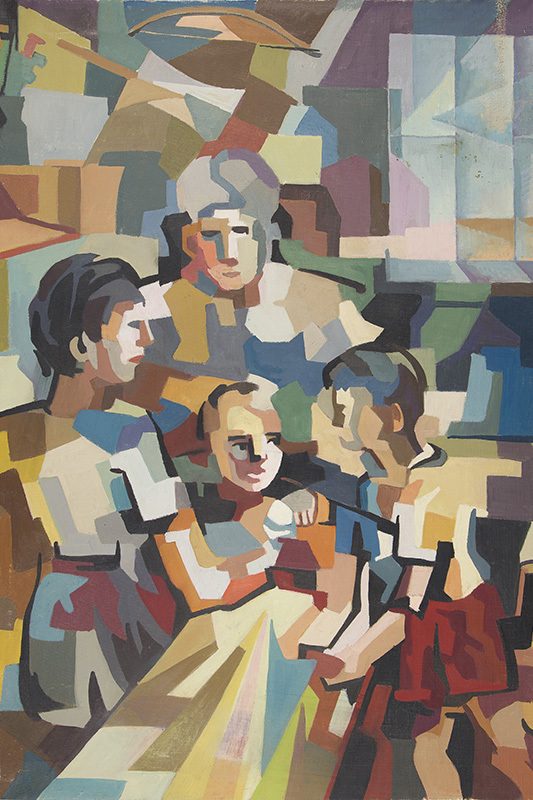 The first edition in 1964 recognised the painter Faik Hassan and the sculptor Mohammed Ali, while in the second edition, in 1966, two painters were chosen: Lorna Selim and Kadhim Haider. The committee took the decision not to award a sculptor, since it was considered that painting was developing at a greater speed than sculpture, which caused a stir among artists and complications for the prize’s future, which was finally discontinued. 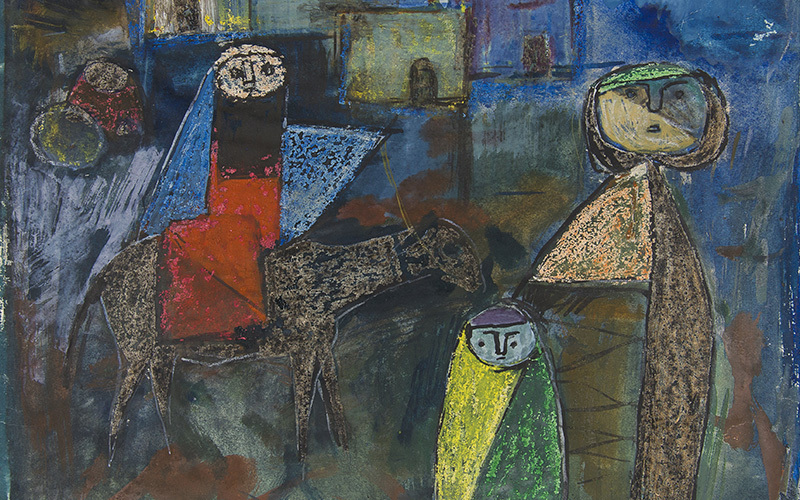 Following the Gulbenkian Cultural Week in 1966, three young Iraqi artists – Rafa Nasiri, Salim al-Dabbagh and Hashim Samarchi – successfully applied for funding to study in Europe, arriving in Lisbon as recipients of Calouste Gulbenkian Foundation scholarships to attend a course at GRAVURA [the Portuguese Printmakers Cooperative] between September 1967 and November 1968. This was the first time the Cooperative had received foreign artists for the purposes of developing art within their workshops. 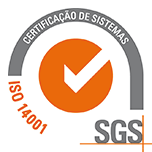 Subsidised by the Foundation, the course was directed by Alice Jorge and João Navarro Hogan. 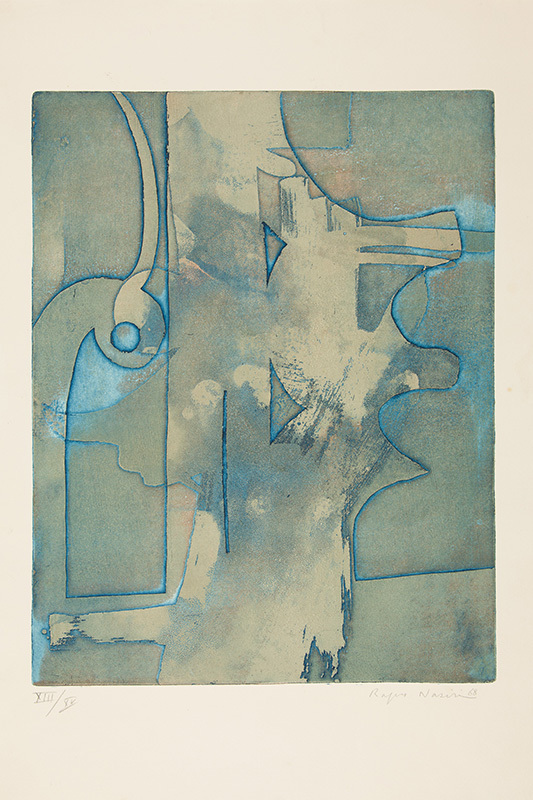 In the final course report, Alice Jorge noted the notable professionalism displayed by the artists, who during the months of the course had become familiar with the full gamut of printmaking techniques, evolving aesthetically. They established good relations with the Portuguese artists and participated in three group exhibitions while in Portugal. The return of Rafa, Salim and Hashim to Baghdad following their stay in Lisbon marked the beginning of the development of printmaking in Iraq. 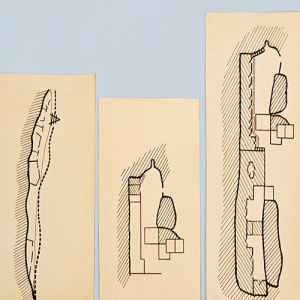 This initiative of the Calouste Gulbenkian Foundation as a member of the Future Architecture Platform, a project that is co-funded by the Creative Europe Programme of the European Union.